A few years ago, I got addicted with scrapbooking. So being a person who likes to shop, I ended up filling up all the shelves and drawers with basic items and embellishments for scrapbooking. 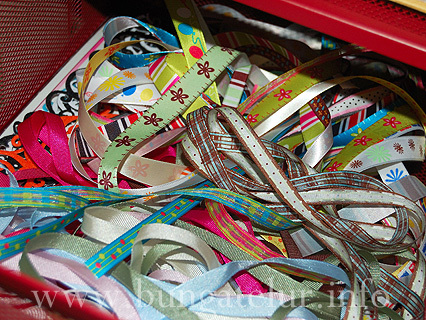 Things like ribbons, glues, stamping supplies, clear stamp, acrylic paints, chipboards, brads, stickers and patterned papers, just to mention a few..huhu! Most of the items I bought through ebay using money I earned from blogging, which was deposited in my paypal account. Come to think of it, I must have spent thousands if converted into local currency. But then again, that’s what you do when you have a hobby. See those Brilliance Dew Drop inkpads from Tsukineko in the picture above. It was great for stamping. It costs a lot more if I buy them in local scrapbooking store. Of course there are many other type of inkpads, but so far that’s what I have tried. I am very tempted to buy Tim Holtz Distress Ink after watching a demo video on twopeasinabucket.com but since I have very little free time to indulge in scrapbooking, I think I have to be patient for now. The cover for the personal album has been done more than a year ago but till now I still don’t have time to complete the inside pages of the album. 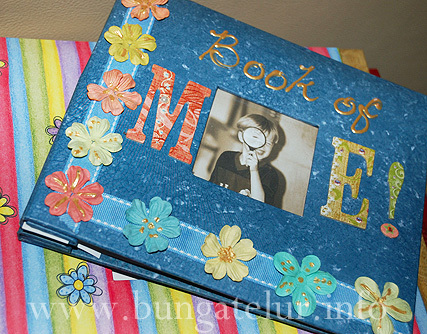 Perhaps it could be a new year resolution next year to complete that Book of Me album..haha!